Pixologic has posted a teaser image for ZBrush 2019, the next major update to the digital sculpting software, hinting at new camera and folder systems and updates to the remeshing and Spotlight toolsets. The full feature set will be unveiled in a company livestream on 5 March 2019. As you might expect of a single still image, the teaser doesn’t give that much away when it comes to details of the new features in ZBrush 2019. However, it does reference two features that Pixologic has previously announced: the option to group SubTools into folders, and a new standard camera with real-world lens properties. We covered both when the company unveiled them at ZBrush Summit last year, along with a new UV unwrapping plugin, so check out our original story for more details. Entirely new: new Alpha Mesher toolset and updates to ZRemesher and Spotlight? Other toolsets listed on the signpost in the background include ZRemesher, ZBrush’s automatic retopology system, and Spotlight, its projection texturing system. The signpost also references what appears to be an entirely new toolset, Alpha Mesher. Updated 6 March 2019: it actually refers to the new Snapshot3D feature in Spotlight, which extrudes a 2D alpha into a 3D form. Check out our story on the full feature list in ZBrush 2019. Pixologic hasn’t announced pricing or a release date for ZBrush 2019 yet. The complete feature set is due to be unveiled during a livestream on ZBrushLive on 5 March 2019. 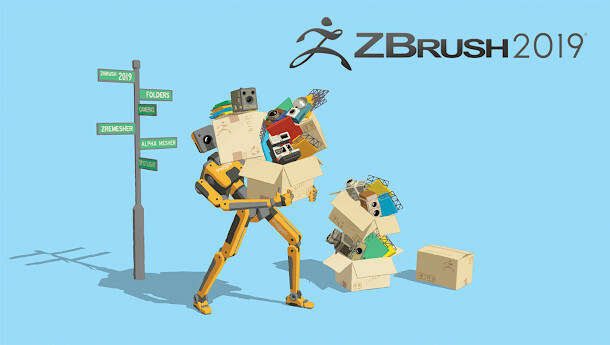 The current release, ZBrush 2018.1, is available for 64-bit Windows Vista and above and Mac OS X 10.8 and above. New licences cost $895.